After my last review, I was a bit slow on picking up with the rest of this series. Looking back, I wish that I had jumped right back in to it. The summary of the next few episodes is simple. Kaoru really gets in to playing jazz with Sentaro. The two of them end up having daily jam sessions in which Kaoru learns to not be so stiff, and go with the flow of the music. Through this, Kaoru grows as his friendship with Sentaro further develops. It is really nice to see this kind of character development. The series is full of misadventures and now there is a strong element of romance. Seeing as though these are just high school students, the romantic relationships (and friendships for that matter) will fill you with high school nostalgia in which you are seeing people fall in love for the first time. There are a lot of firsts happening for these kids; some good and some....uhhh...not so good. Not to mention that kids in love in many cases leads to drama. There's even a bit of a love conundrum in here. All in all the story has been progressing nicely. It moves a bit quickly at times but that has not taken away from the viewing experience. For me, the highlight of this series is the music. I have always enjoyed listening to jazz when I was growing up. Don't ask me to name any musicians though. I like the sound but never got too deep in to who was actually playing them. 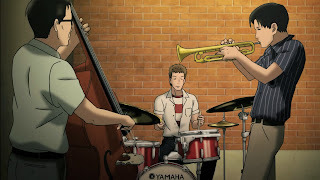 This series really touches on what it would describe as being jazz classics. The addicting tunes and great music produced by Sentaro and Kaoru always leaves me excited for the next episode. It really creates a great mood for the series. 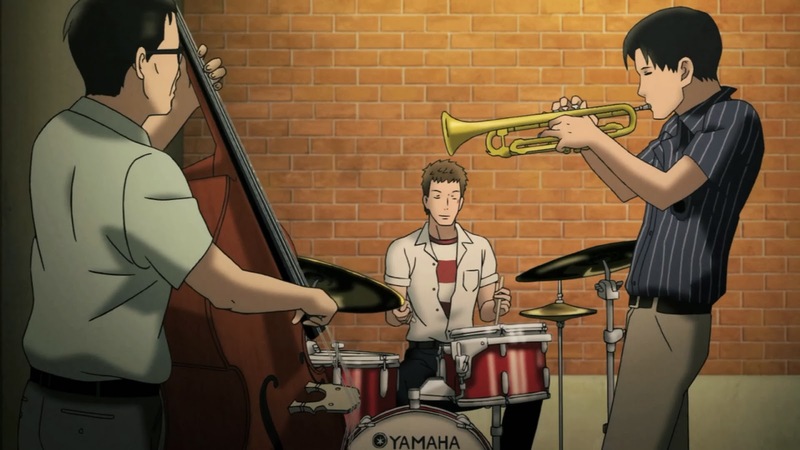 We're even treated to a few jam session with the main characters playing in a jazz quartet. If you're interested in watching this anime, you can find it on Crunchyroll and Hulu.